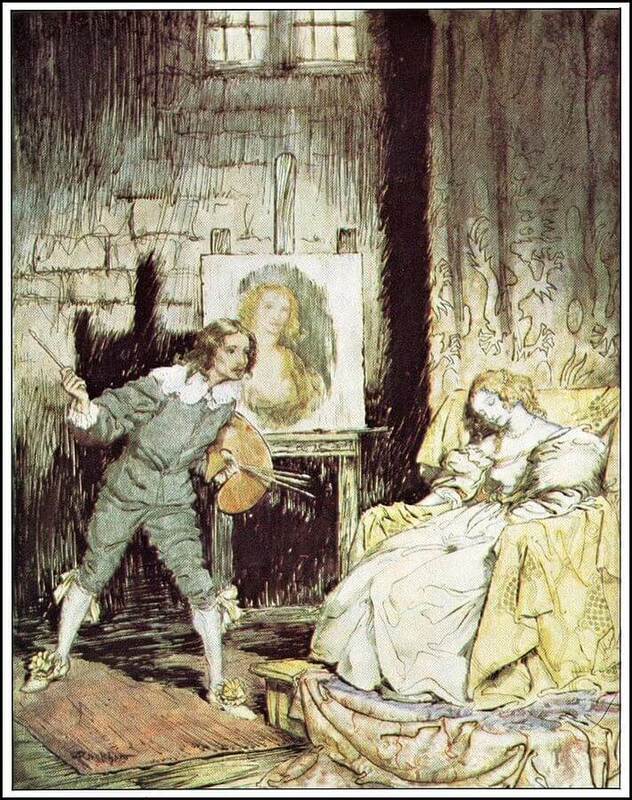 Arthur Rackham illustration of "The Oval Portrait"
But the action produced an effect altogether unanticipated. The rays of the numerous candles (for there were many) now fell within a niche of the room which had hitherto been thrown into deep shade by one of the bed-posts. I thus saw in vivid light a picture all unnoticed before. It was the portrait of a young girl just ripening into womanhood. I glanced at the painting hurriedly, and then closed my eyes. Why I did this was not at first apparent even to my own perception. But while my lids remained thus shut, I ran over in my mind my reason for so shutting them. It was an impulsive movement to gain time for thought—to make sure that my vision had not deceived me—to calm and subdue my fancy for a more sober and more certain gaze. In a very few moments I again looked fixedly at the painting. "She was a maiden of rarest beauty, and not more lovely than full of glee. And evil was the hour when she saw, and loved, and wedded the painter. He, passionate, studious, austere, and having already a bride in his Art; she a maiden of rarest beauty, and not more lovely than full of glee; all light and smiles, and frolicsome as the young fawn; loving and cherishing all things; hating only the Art which was her rival; dreading only the pallet and brushes and other untoward instruments which deprived her of the countenance of her lover. It was thus a terrible thing for this lady to hear the painter speak of his desire to portray even his young bride. But she was humble and obedient, and sat meekly for many weeks in the dark, high turret-chamber where the light dripped upon the pale canvas only from overhead. But he, the painter, took glory in his work, which went on from hour to hour, and from day to day. And he was a passionate, and wild, and moody man, who became lost in reveries; so that he would not see that the light which fell so ghastly in that lone turret withered the health and the spirits of his bride, who pined visibly to all but him. Yet she smiled on and still on, uncomplainingly, because she saw that the painter (who had high renown) took a fervid and burning pleasure in his task, and wrought day and night to depict her who so loved him, yet who grew daily more dispirited and weak. And in sooth some who beheld the portrait spoke of its resemblance in low words, as of a mighty marvel, and a proof not less of the power of the painter than of his deep love for her whom he depicted so surpassingly well. But at length, as the labor drew nearer to its conclusion, there were admitted none into the turret; for the painter had grown wild with the ardor of his work, and turned his eyes from canvas merely, even to regard the countenance of his wife. And he would not see that the tints which he spread upon the canvas were drawn from the cheeks of her who sat beside him. And when many weeks had passed, and but little remained to do, save one brush upon the mouth and one tint upon the eye, the spirit of the lady again flickered up as the flame within the socket of the lamp. And then the brush was given, and then the tint was placed; and, for one moment, the painter stood entranced before the work which he had wrought; but in the next, while he yet gazed, he grew tremulous and very pallid, and aghast, and crying with a loud voice, 'This is indeed Life itself!' turned suddenly to regard his beloved:—She was dead! Add The Oval Portrait to your own personal library.